What is Amazon PPC, or Sponsored Products? Which basics should I know before starting? How do I create and optimize Amazon PPC campaigns? Interested in more advanced tips? Click here for our Amazon PPC Guide for advanced users. 1. What is Amazon PPC, or Amazon Sponsored Products? Promoting products on Amazon: How do Amazon Sponsored Products ads work? 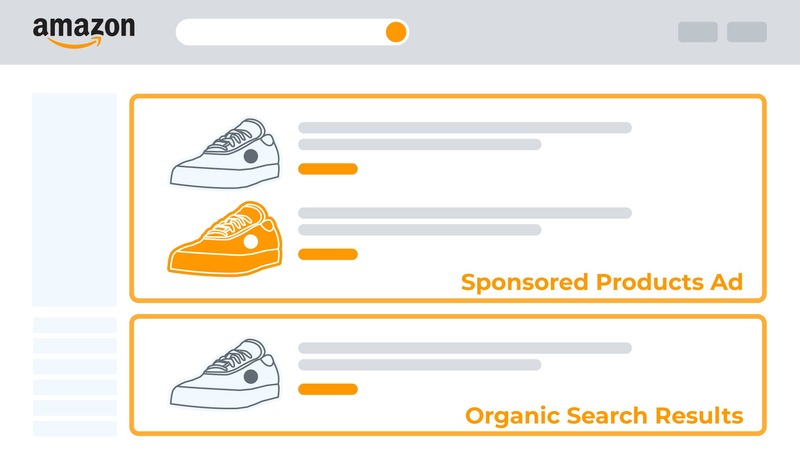 Sponsored Products ads appear directly in the regular, or “organic” search results on Amazon — and that’s exactly what makes them so effective. Customers that visit Amazon to buy something specific see suitable advertisements for their search term during the search and purchase process. Compared to ads via Google or Facebook, the intent to purchase is, on average, significantly more plausible on Amazon. How much does Amazon PPC, or Amazon Sponsored Products cost? The cost-per-click (CPC) depends on the highest bidder: An auction determines which Amazon PPC ads will be displayed. Each advertiser submits a bid for their ad. The highest bidder wins the highest ad position — but also pays the highest price. The typical click rates, or CPC, for Amazon.com currently range from a few cents up to three US dollars. Can advertising on Amazon improve my organic ranking? Yes. Sales volume is one of the most potent factors for ranking on Amazon. The sales volume includes any sales from Amazon PPC campaigns, so promoting products via Amazon PPC can indeed improve organic ranking. That’s why Amazon PPC campaigns are especially useful for launching new products. Even established products can, however, benefit from Amazon PPC campaigns by providing a lasting improvement of the Amazon ranking (more information on the relationship between Amazon SEO and Amazon PPC). 2. Which basics of Amazon Ads should I know before getting started? It’s very easy to create Sponsored Product campaigns and to start promoting products on Amazon. Before you start, you should still familiarize yourself with a few basics. To manage Amazon Sponsored Products campaigns effectively, you need to first understand the basic elements of Amazon PPC (more info on the basic technical terms here). Search Terms Vs Keywords: Search terms are the words a customer enters, the terms that can cause an ad to appear. Keywords, on the other hand, are the terms that advertisers bid on for the competitive positioning of the ad. Depending on the match type, one keyword can cause the ad to display for multiple search terms. Match Types: Match types determine how close the match between a keyword and search term needs to be for an ad to appear. There are three types (Exact, Phrase, and Broad). In a nutshell, a broad match type will cover many search terms in a campaign but will lack precision. In contrast, the effort to manage closer match types (esp. Exact) is quite high, but it allows for much more precise control. Campaign Types: In automatic campaigns, Amazon displays your ads automatically for specific search terms (thus allowing automatic keyword research, see below) — Only one overall CPC bid is set. In manual campaigns, you determine your own keywords, match types, and keyword CPCs. You will have more precise control, but it also requires more effort. To accurately assess the performance of Amazon Sponsored Products campaigns, you should also know the key metrics — and how to interpret them. (Attributed) Conversions or Orders: The number of orders that were placed after clicking on the ad. By default, an order is assigned to a click on an ad if it occurs within one week after the click. Note that this also includes orders other than the advertised articles. (Attributed) Turnover:The turnover generated by the attributed orders. To calculate the margin, deduct all relevant costs (taxes, Amazon fees, product costs, overheads) from the price. In our example, there is still a 20% margin left to spend on advertising campaigns without loss. The so-called break-even ACoS is therefore 20%. 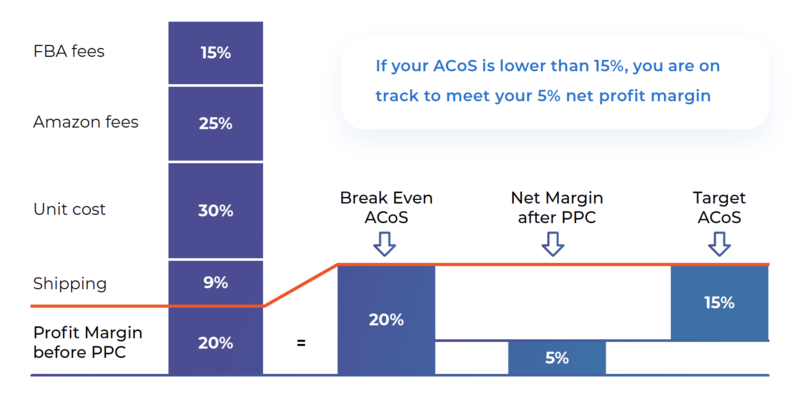 If you want to leave a margin after advertising (for example 5%), you will have to subtract it from the ACoS to get your target value (target ACoS) — in our example, the target ACoS is 15%. Keyword Reach: Amazon displays an ad for a specific search term only if the product page includes similar keywords. Optimize the product page for all relevant keywords. CTR and CR: Good pictures, text, reviews, etc. on the product page increase the click-through rate and conversion rate of the product and thus of the advertisements. 3. How Do I Create and Optimize My First Amazon Sponsored Products Campaign? Here’s a simple and effective start-up strategy: Combine an automatic and a manual campaign for the same product or set of products. Use the automatic campaign for continuous keyword research. At the same time, keep feeding the manual campaign with good keywords from the automatic campaign. The manual campaign allows precise control and optimization of the keywords. Make sure that the products in the product set you’re compiling for these two campaigns have similar keywords and product margins. Creating an automatic campaign is easy. All you need to do is name your campaign (or ad group) and define a budget and a CPC bid. As soon as your campaign kicks off, Amazon examines the advertised products and automatically starts displaying your ads for selected search terms. You can export these search terms as a .csv file in Seller Central or conduct an easy, in-depth analysis of them in the Sellics PPC Manager. Create a manual campaign to add your own choice of keywords. An excellent resource to research these keywords is Sonar, Sellics’s free Amazon keyword research tool (Check out this guide to Amazon PPC Keyword Research with Sonar). For a decent basic coverage, research the 20 to 30 top keywords and add them to the match type “Broad”. Routine optimization is critical to the success of Amazon Sponsored Products campaigns. Make sure you always collect enough data to support your decisions, though. To be specific: Wait at least one week between each optimization run. Exclude irrelevant or expensive search terms (evaluate search terms via .csv export in Seller Central or directly in the Sellics PPC Manager). Keywords with few or no impressions: Check if keyword is missing from product if there are no impressions. In case of low impressions try increasing the keyword bid. Sellics’s PPC Manager dramatically simplifies the management and optimization of Amazon PPC campaigns. Use our PPC Manager to maximize revenue and optimize your Advertising Cost of Sales (ACoS). Save time and automate your keyword bids with our Bidding Automation feature. The PPC Manager is available in our Sellics Seller Edition and Vendor Edition. Save time with automatic bids etc.